Oh my goodness, I've been so anxious these past few months to share a bunch of new things with all of you that Cason and I have had in the works. One of the biggest being, that we have partnered up with our MOST favorite local shopping villages here in Utah, to help us with some designing and decor for our home! 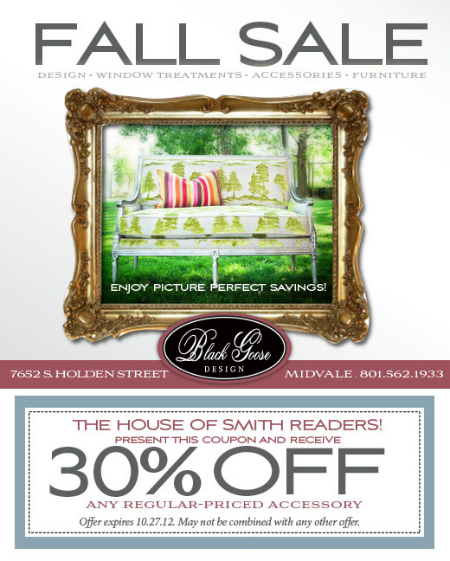 The Black Goose Design and Gardner Village! If you've ever written us an email or sent us a message wondering where we get a lot of our super cute decor or bedding, more than likely, it's from one of the many adorable, fun, amazing stores affiliated with Gardner Village. 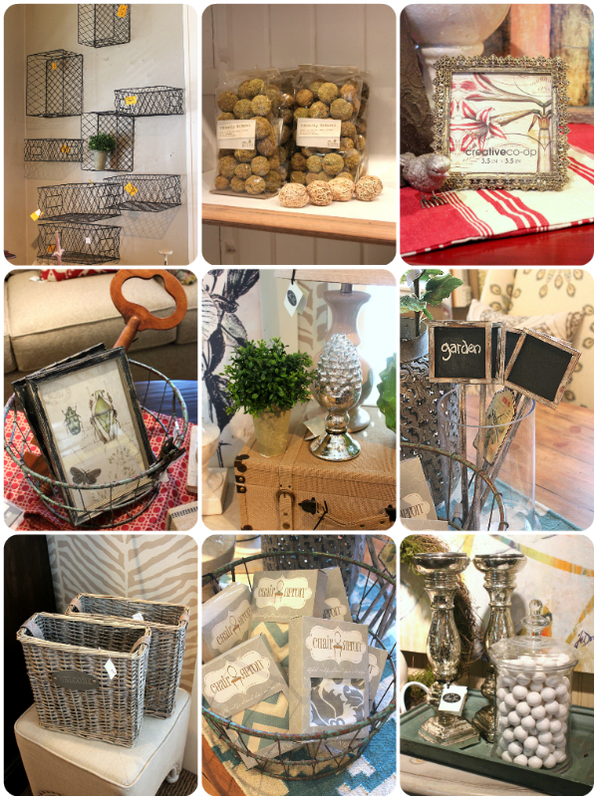 We've been shopping there for the majority of our daily and holiday decor for the past 6 years, and as of recently, we've paired up with one of Gardner Village's sister-stores The Black Goose Design, to help us with a few things around our home. 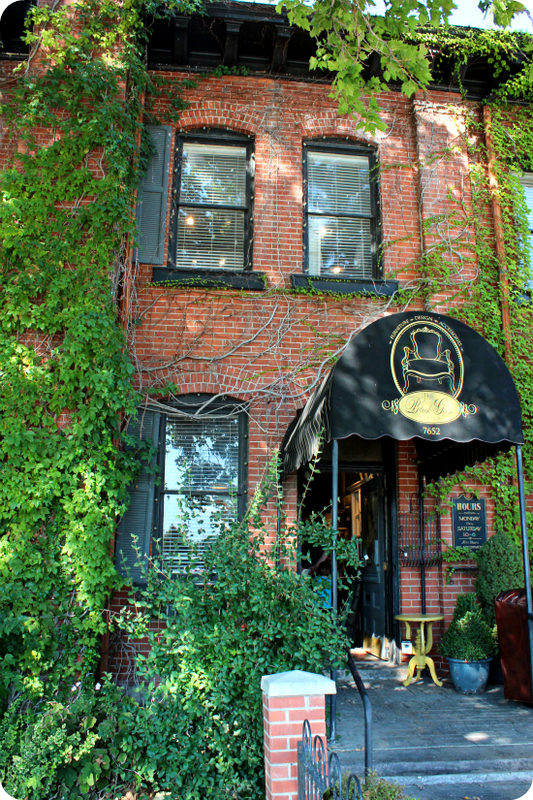 Nancy Long, a woman with an entrepreneurial spirit and seasoned retail experience, purchased this beautiful brick building, now known as The Black Goose Design in 1985. As founder of Gardner Village, located just a half mile west, Nancy opened Country Furniture & Gifts in the old Gardner flour mill in 1980 and that became the beginning of Gardner Village. The Black Goose Design was opened after requests from customers who wanted a wider selection of home decor and a shop that could also meet their needs when it came to questions about interior design. Today, The Black Goose Design and Gardner Village are owned and operated by two of Nancy’s children, Joe Long and Angie Seeley, who are carrying out the legacy of their mother. As a brother/sister team, their business philosophies are much the same as their mother’s; to offer a unique, broad selection of quality home furnishing and décor combined with outstanding customer service. 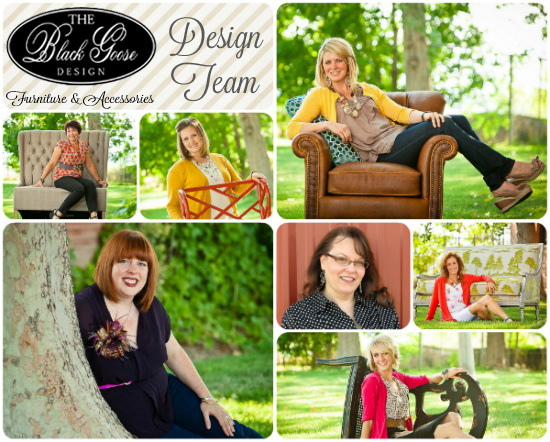 The Black Goose Design is now home to one of the Salt Lake area’s most charming furniture and design showrooms and proudly features a highly-skilled and talented team of award-winning interior designers. 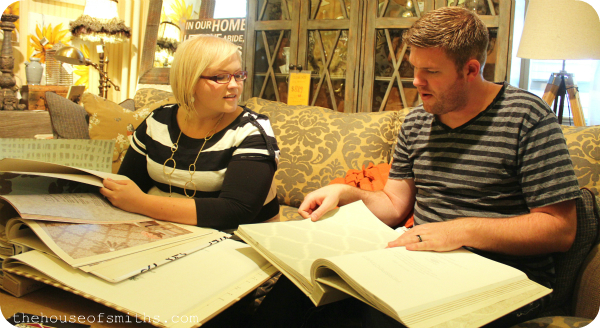 Their goal is to make your home uniquely yours with quality and timeless design and furnishings. They feel their work is important to the lives of their clients and their families and welcome you to stroll through their showroom and experience eye-catching displays that will inspire you. 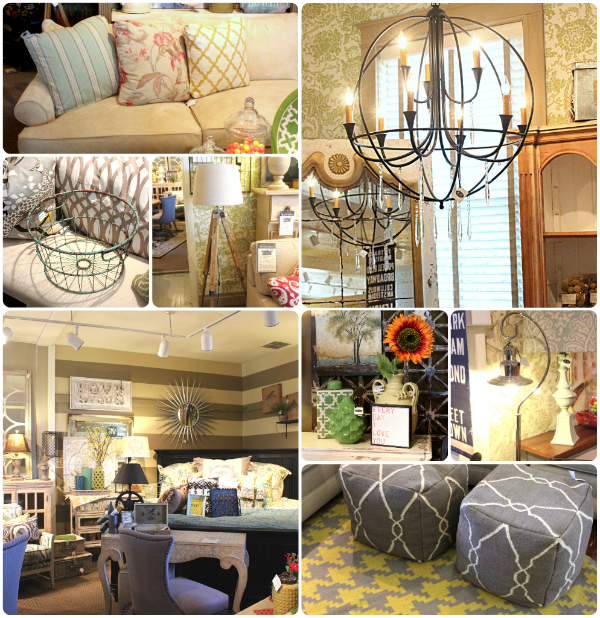 The store is brimming with the latest styles in home décor and furniture. Their specialty is handling special orders and custom orders for clients who want to make sure their home is unique and personal. The team can assist you with the purchase of just one item or help you design your entire home from the floor plans to the completed project. What I love about Black Goose Design, besides how incredibly helpful, friendly and knowledgeable the entire staff is, is that the store is jam packed with tons of awesome, up-to-date, traditional AND trend-setting decor and furniture... and what I like even more, is that if you're looking for a really special custom piece, you can design it here! Browsing through wallpaper books with my guy. Yes, we're doing wallpaper somewhere soon! Don't get me wrong, we love shopping at big box retailers for home decor, they have great stuff, but sometimes we just want to budget for something totally unique and extraordinary, that nobody else has. Something that makes our design our OWN... and that's what the talented licensed interior designers at The Black Goose understand. That being said, yes, custom designed furniture and accessories CAN be expensive, but there are also tons of other budget friendly items in their shop too, if you're simply looking to dress up a shelf or table top with something special. Honestly, we usually just end up getting lost in all the displays and room set-ups; gathering inspiration and ideas for our space. I love the exposure to designer goods and fabrics here, that I sometimes miss out on at those other big-box stores. Because I knew how much my readers would love to get a special discount/deal, I asked Brooke, the manager, if she'd be willing to include a killer coupon for our readers to use when they came to visit her store and happily, she said yes!!! Just print this coupon off and you're golden! Also, before you head in, make sure to check out their Fall Sale Flyer. Lots of great pages to look through here! 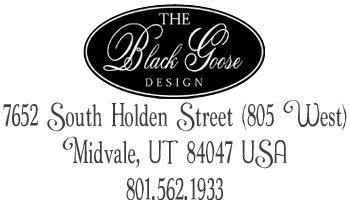 Like mentioned before, The Black Goose Design is located about a half-mile east of Gardner Village in Midvale Utah, and it's definitely a MUST-see if you're into decor like I am! You can also visit The Black Good Design on Facebook, to stay updated on all of their sales and events they have going on. We're stoked to show you what we've designed and ordered from The Black Goose, that will hopefully get you inspired to start making a few unique changes to a room in YOUR home! Updates coming soon! I know you'll love this adorable store as much as we have, and make sure to tell all the pretty ladies that we say "hi!" when you visit! I love shopping at Gardner Village! I love the bedding at the Quilt Shop. A little hint- if you get their mailer they often have a 20% or 40% (can't remember) for an accessory! I'm constantly torn about splurging on furniture. I have two young kids and another on the way. I have a beautiful Bernheart leather sofa ($$$$) that we bought before our kids were born and now I need to replace it because my 2 year old put a hot iron on it (singed the leather badly) and somehow a black magic marker has found it's way onto in in several areas. They also ruined my beautiful 6 month old white leather office chair with a black magic marker!!! It's just frustrating because I love that higher end look but can't stomach the thought of my kids ruining a custom piece of upholstery. Tamara, this trick hasn't worked for everyone I've told about it, but it has for some, so that makes it worth a try. I'm guessing it depends on what kind of leather is on your furniture. i LOVE wallpaper and i am uber jealous of that store...we don't have anything that good here or maybe i need to get out a little more and investigate! I may just have to get you to shop for me and have them ship it!!! what is in the 10-30 on the bottom is it chair fabric?? i think i see chevron! Every time you mention these cute little shops in Utah it makes me miss it. I think I need to plan a trip and maybe I'd be lucky to bump into you! Yay! What this is such a beautiful store every time I go in I seriously want to move right in! I could spend forever in there just getting inspiration soaking in ideas. Thanks for the Coupon Shelley! I wish they had an online store. Beautiful things! I wish we had stores like that in my town. I love to see you and Cason on your blog. Of course I love to see the girls also. I love Gardner villiage and before we moved I would go there alot, just to look around. I always wanted to go into the Black Goose, mostly because I love the name, but never got there. Keep up the good work and Shelly Did I miss the Master Bedroom reveal? You have been working on it for quite some time. What's the deal? Grandpa and I love all you guys and we miss seeing you on a regular basis. Love and kisses, Grandma and Grandpa Carlisle. Really nice furniture..This furniture is a stylish here is a lot of useful information,really good post thanks for your knowledge. Kelly at Black Goose is amazing. I live out of state but make a stop there every year when we go on vacation. Kelly never fails at helping me find just the right things to enhance my home. I can't wait to see what you found there! Kelly at The Black Goose is amazing. I live out of state, but go in to see her when we are on vacation there and she always helps me find the best things to enhance my home. I can't wait to see what you get! 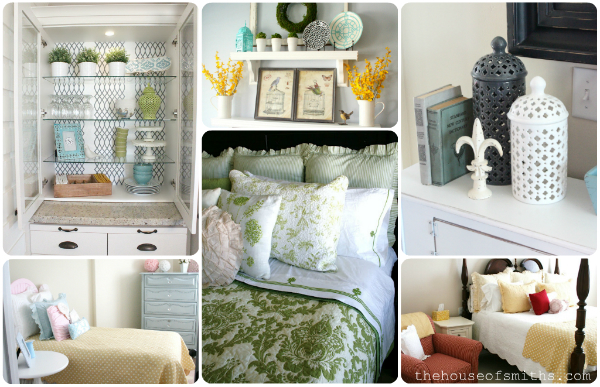 I love visiting Utah and I especially love visiting the small furniture and home decor shops in Utah. Last time I visited the beehive state I found the cutest Utah furniture store. I go to Black Goose a lot too but it depends on where I am in Utah when I visit. I love your blog. This is a hot site and I wanted to post a little note to tell you, good job! Best wishes!! !